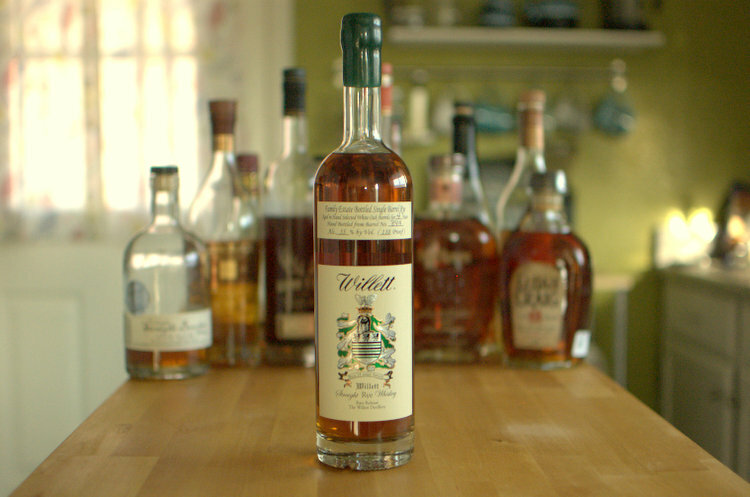 I was tipped off by a friend that AJ's Arcadia had a bottle of Willett Rye available. I'm always a sucker for a good rye, and I also thoroughly enjoy Willett's Pot Still Reserve Bourbon, so I figured that a trip over to AJ's was in order. The good folks manning the "wine cellar" -- namely Jackie and Dave -- were kind enough to put the bottle on hold. I know enough to know that one shouldn't judge a whiskey by its bottle, but I'd still be very tempted with the Willett Rye. It's really a beautiful bottle. In addition to the Willett Rye I picked up, they had a fairly large selection of rare whiskies (primarily scotch). They had a Macallan 25 (for $928), a rare Oban 18, and most of the Balvenie and Aberfeldy collection. Interestingly, in the same display case they also had several Hudson Baby Bourbon iterations. I've never tried any of the HBBs, but I've heard mixed things (mostly negative); even the people who like it seem to think it's overpriced at around $60 for a 375ml bottle. It's funny to me that it occupied the same space as the high-end scotches. I'll definitely be back to AJ's soon.